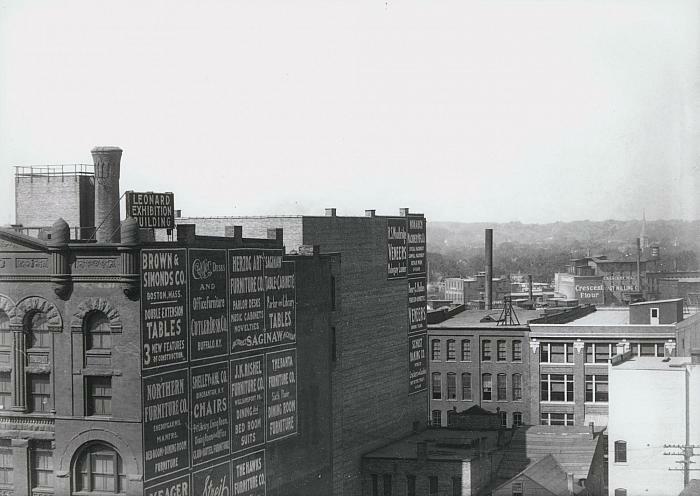 The Leonard Exhibition Building, not to be confused with the Leonard Building on Market or another on Fulton St., is identified by the sign on the roof of the building. All the advertisements on the side of the building, except two at the far right, have to do with the furniture industry. The building was located at the corner of Ottawa and Ferry. The photo looks slightly to the northwest and across the Grand River, and in the distance the Voigt Mill can be seen on the west bank of the river. The building is quite similar in architecture to the Herpolshimer Department Store. At a later date the name was changed to the Helmer Building.